Arizona Shutters are the premier suppliers and installers of wooden Interior plantation window shutters in Dorset, Hampshire,West Sussex, Wiltshire, Somerset, Bath, Surrey and Avon. 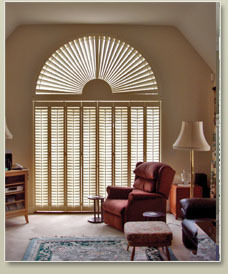 Arizona Shutters is the ONLY Shutter co. to offer a FIVE YEAR warranty. Our founder has over 15 years experience in window dressing in America (the birth place of PLANTATION SHUTTERS), which has helped us to bring some of the American style , technique and design to Britain. Working for over 5 years in the UK, specialising in shutters has given us a feel for the unique architecture and design of the windows and openings that are found through out the British Isles. We provide shutters of all kinds: Interior shutters, shaped panels, square shutters, framed shutters, wood shutters, mdf shutters, painted panels, lacquered panels, oiled panels, stained shutters, solid panels, solid base with louvered top, single shutters, bi-fold panels, multifold panels, products in 7 standard whites, As well as custom colour shutters. I too have shutters from Frankie at Arizona Shutters - my house is an old 1930s house and the window frame was literally wavy! Somehow Frankie managed to build a frame and fill in so the finish is perfection. He worked very cleanly and calmly despite the terrible wonky walls and ceiling surrounding the window. I would recommend him without hesitation. Nice professional man who produces fantastic results at an affordable price! All of our products come with a shutter warranty against discolouration and warping. Our shutters are the best quality available in the UK market. There are many shutter suppliers and manufacturers world wide making shutters of different quality from the cheapest to the most costly shutter, but the price of a shutter does not indicate the quality of that shutter, the shutters we supply are not only of the highest quality but also the best value money can buy. We have made our business work on only providing the best interior shutter installation, with shutters from the top shutter manufacturers in the world. This gives our clients not only a great service but also the confidence of making the right shutter purchase. We offer shutters in 5 louvre sizes, 32mm, 47mm, 63mm, 89mm and 114mm louvred shutters. We have a vast amount of experience in shutters, meaning there is not an obstacle or type of installation that we have not come across. We love a challenge! Example: We have a great deal of expertise in measuring and fitting complicated Conservatory Shutters as well as problem bay shutters, which less established companies shy away from. We have various tilt rod options including, window shutters with offset tilt rods and shutters with hidden tilt rods. Our product range contains shutters made from Cedar, MDF (as mentioned earlier) and our latest panels made from Mediterranean wood. In Conclusion: We offer the widest range of wooden shutters in town!